More than 70% of the Earth is made up of water, yet only a small percentage of that water is drinkable. This simple fact fascinated my kids the other day, and led to some big juicy conversations around our table at our morning time. We were diving into our latest Think Outside Boxes delivery — the water box (see what I did there?). And, it’s just as great as the first two we’ve received. I’m seriously so excited about this subscription this year. The kids are loving their new backpacks from the intro box and the fun tools they received in their night boxes. This water box might be my favorite so far. 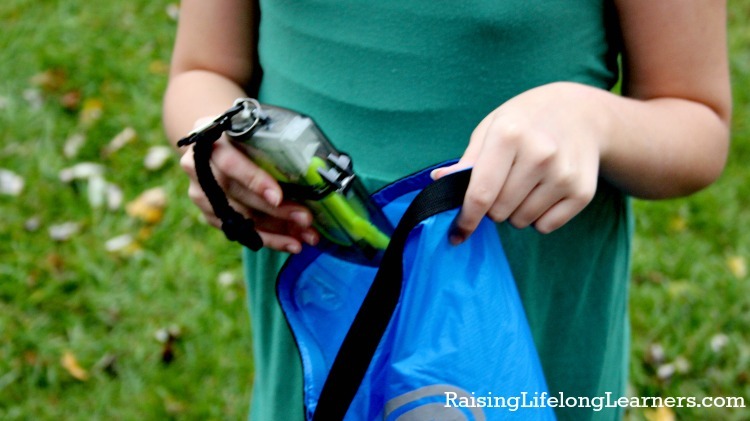 This time, the kids received a dry bag that comes with a built in safety whistle and can be used in a variety of ways — some of which are suggested in the activity guide that accompanies each new box. 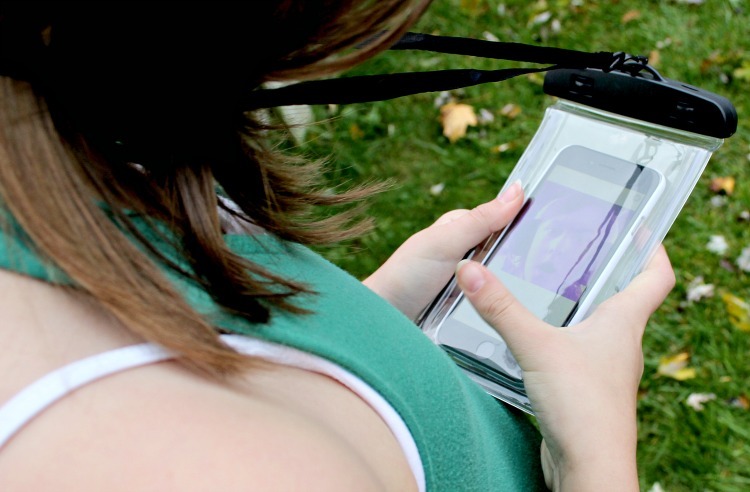 They also pulled out a waterproof pouch that can hold a cell phone and keep it safe and dry. 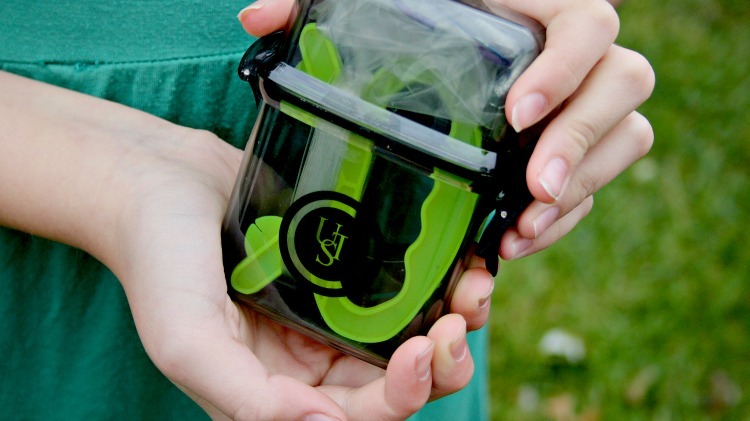 It can hold money, a wallet, or a cell phone, and has a glow-in-the dark frame. The kids’ favorite tool is the small fishing kit that comes with resource cards on survival fishing. They clipped the cards to the large ring they found in their first box. And now they are suggesting that I drop them off somewhere that has water where they can fish and survive off the land. Unfortunately for them, they’ll have to survive off the land with me nearby. I’m not quite ready to abandon them in the wild somewhere quite yet. 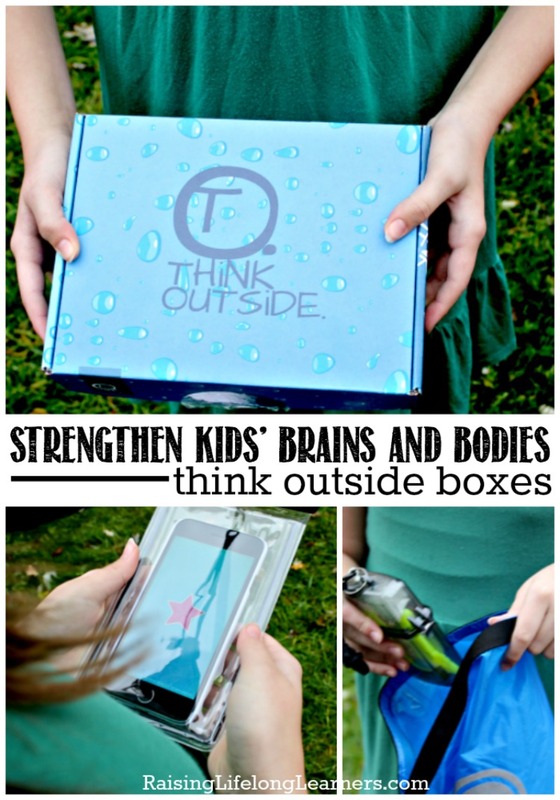 Beyond the fun we’re having with the Think Outside Boxes subscription, there are so many benefits to getting kids outside on a regular basis. Really, nature helps cognition, moods, attention, and general well-being. Time spent in nature and increased levels of fitness is linked to higher cognitive function. Outdoor play and time spent exploring nature encourages creativity and imagination. Kids tend to be more active outside than in, so their fitness levels improve — which can be a sneaky way of getting kiddos who would rather be building LEGO or coding to pull themselves away from a sedentary life. Time outside in nature can help moods, alleviate depression, and quell anxiety. People just feel better when they’re outside. Being outside can also increase attention spans because things move at a slower pace in nature. There are health benefits, too. Being outside increases vitamin D levels, thus lowering the risk of cardiovascular disease, increasing bone strength, boosting the immune system, and helping to reduce inflammation. I’ll admit that it’s been especially hard getting the kids (and myself!) outside as the days have shortened and dusk has come darker and earlier, but it’s so important and these boxes are helping to motivate us. 1. A great gift idea. 2. A gift that continues to give throughout the year. 3. A gift that can double up and “count” for some of your homeschooling. And don’t forget that Think Outside Boxes has a $10 off offer for Raising Lifelong Learners reaaders if you use the code RLL10 when you check out on their site. Let me know what other ways you encourage your kids to get outside and soak up all those mental and physical health benefits. Share in the comments or on social media tagging #RaisingLifelongLearners and #ThinkOutside.